Jessica just started a new job working security at a museum (queue the Night at the Museum jokes), so between that, a couple other art obligations, and preparing to be in a friend’s wedding, the next Satan Ninja page has been delayed. But hey, she's looking mighty snazzy in her new uniform! (By the way, she still has blue hair, but she has to wear a wig to work, since the museum isn't cool with having a blue-headed security guard--but they're totally fine with displaying naked corpses). If you haven’t already, you can sign up for our =true&group=true]mailing list and we’ll shoot you an email as soon as a new page goes live. I already made a night at the museum joke on Facebook so I'll spare you. Good luck on the new job Jessica! Is Jessica going to pursue a career in law enforcement and this is just a stepping stone? No, this is more Jessica wanting to add some structure and steady income to her life. 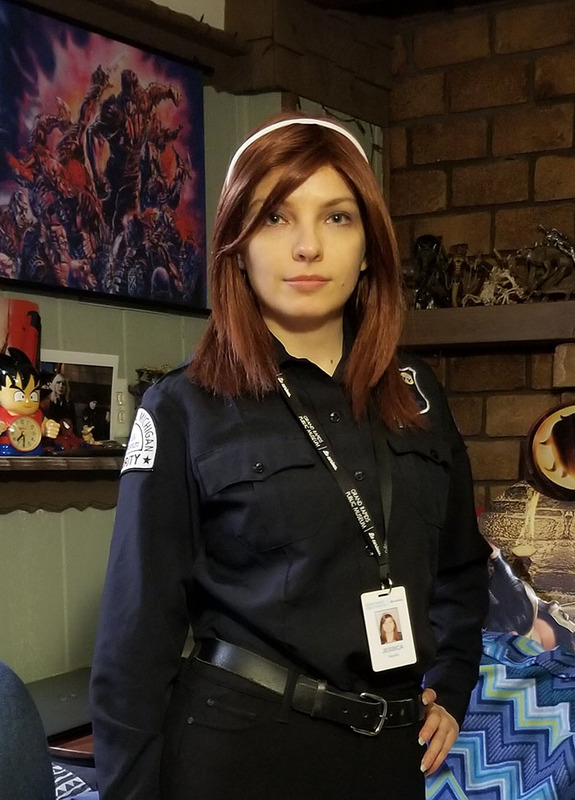 She's really into science and history, so she was interested in working at a museum, and saw that they had an opening for a security guard position. Jessica certainly does look snazzy in that uniform. Anyways, I hope the job is going well for her. I also signed up for the mailing list. I'm really looking forward to what's coming next in the comic! I'm on some serious Jessica withdrawal. The uniform is badass. Hey, super awesome to see you here, dude! Jessica got caught up doing a bunch of art for a friend's wedding, but it was a surprise, so she didn't want to stream while working on it. That's why she's been gone from Twitch for a while. But now that that's done, she'll be streaming again this week, I'm sure. How much of a job would it be for Jessica to get her hair back to it's original color? She'd have to go quite a while without dying it, but I don't see her doing that anytime soon. She's been coloring her hair since she was about 13, so we're not even too sure what her natural hair color would look like now. She's a natural blonde, but her hair's probably a much darker blonde now than when she was little. It'd be interesting to see.